Leather is a strong and durable material that doesn’t require much work to stay in great condition. Making the effort to look after your Chesterfield leather sofa will help keep your sofa or chair looking fantastic for longer and prevent damage from wear and tear. So here are a few simple tips to help keep your leather Chesterfield sofa in tip top condition. Wipe down your sofa regularly with a clean dry cloth. This helps to remove any dust and debris. Vacuum the cracks and crevices to remove any dust and dirt. Use a leather conditioner every 6 to 12 months. This helps keep the leather soft and supple, preventing it from drying out and cracking as a result. Mop up spills with a damp cloth. Leather and water don’t mix well so in the event of a spillage, use a damp cloth to wipe away the excess moisture and then dry the area afterwards. Buff scratches and cracks with a microfiber cloth. This can help to reduce their appearance and prevent them from getting worse. 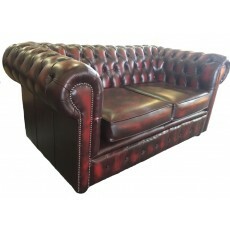 Where possible you should keep your leather Chesterfield sofa out of direct sunlight as this can affect the colour of the leather and increase the risk of cracking too. At Zest Interiors we pride ourselves on offering a wide range of Chesterfield leather sofas and chairs to furnish your home in style. All our Chesterfield sofas offer fantastic value and are available for nationwide delivery so wherever you are you can enjoy a genuine Chesterfield sofa for less! 0 Comments To "How to Maintain Your Genuine Chesterfield Leather Sofa"